Dachshunds are like potato chips..you can't stop with just one!! How very true it is! A baby picture of "Baby Girl" and "Lil' Foot"
This is the critter Dachshunds were bred to hunt for! 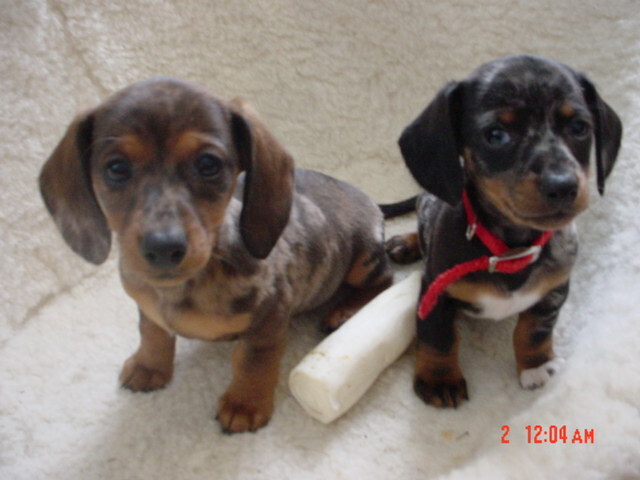 The Dachshund was developed in Germany, they were origanally bred to be hunting dogs, BADGER HUNTERS in particular! They were bred to be long in body and short on leg, and to have a fearless and tenacious attitude. They had to go down into the badgers burrow underground, and kill or drag out the badger! The miniature dachshund was later developed to hunt rabbits. Today Dachshunds are best known as loving family pets, although they still can and do participate in earthdog and field trials. Dacshunds make excellent alert/watchdogs as nothing escapes their attention! They are wonderful house dogs, as they do not have a "doggy" odor, they do not shed much and only require minimal grooming. Dachsies will adapt well to most living arrangments...although lots of stairs are not the best for a dachshund! They are good with MOST other pets...but please remember what they were developed to do! They love gentle children.... of course small kids and dogs should always be supervised, regardless of the breed! Dachshunds are great therapy dogs and do well in obedience and agility, although one must remember that they are a HOUND and must sometimes see whats in it for them before obeying! A Dachsie must be fully trained before being trusted off leash! A fenced yard is their safest bet for off leash time, as they will follow their noses and tend to become TEMPORARILY DEAF if they are following an interesting scent! This can led to great tragedy! Dachshunds can be noisy, (they like to bark) they can also be prone to seperation anxiety and are sometimes hard to housebreak. All can be corrected with proper training. Dachshunds can develop back problems and elbow dysplasia especially if they are allowed to become overwieght. They can also suffer from epilepsy (seizures), luxating patellas (bad knees) and PRA or progressive retinal atrophy, (gradual blindness) Great care must be taken that dogs with these conditions are never bred from! Dachshunds come in two sizes. The Standard is 16 lbs and up. The Miniature is 11 lbs and under at one year of age. Occsionally there are Dachsies that weigh between 12 lbs and 15 lbs, these are refered to by some as "Tweenies", between a Mini and a Standard. They are really just oversized Mini's or small Standards. "Tinies" are just very small Miniatures. Dacshunds come in many colors including: BLACK and TAN, RED, CHOCOLATE and TAN, BLUE and TAN, ISSABELLA/FAWN and TAN, CREAM, WHEATEN, WILDBOAR, BLACK and CREAM, SOLID BLACK, SOLID CHOCOLATE. 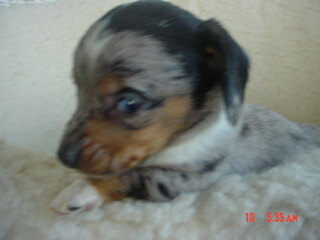 They also have several differnt patterns including: DAPPLE, DOUBLE DAPPLE, BRINDLE, SABLE, and PIEBALD. Dachshunds come in three coat types: SMOOTH, WIRE and LONG. There is endless possibilities in combining these choices! RESULTING IN A DACHSIE SUITED FOR ALL TASTES!! Click the link below for AKC offical Breed Standards.